If there is no video of a game version on Youtube, does it exist? I decided to start reviewing old 1980s games I have in my collection (or in this case, played a lot in the 1980s), typically games most of you really have never heard of. Good or bad, no matter. This is, in a way, a continuation of OkändOnsdag, except now I'm focusing on a single game and without a schedule to adhere to. 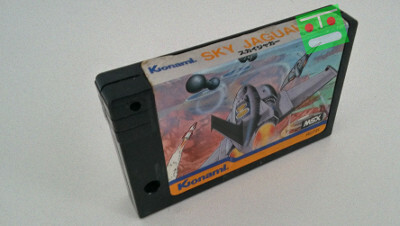 Sky Jaguar (Konami, 1984) - MSX, Arcade? Please excuse me, the cartridge above isn't my own but my friend's. By any definition I know, Sky Jaguar is a very unremarkable game. Searching the web a bit revealed that it's originally an arcade title that I had no clue existed, I couldn't find any Youtube footage of that version and I can't find images of the cabinet either. 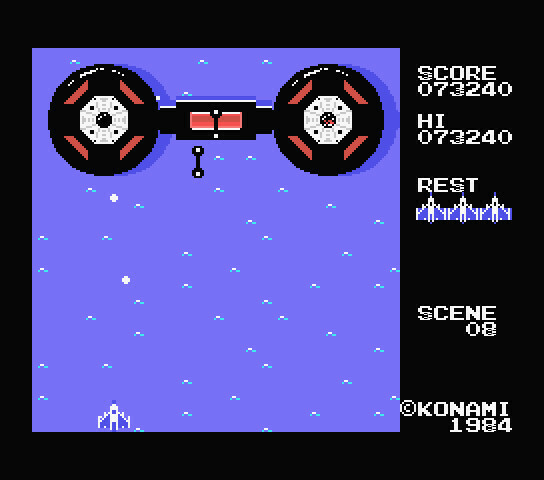 The MSX version is more widely known. George Berkeley (1685-1753) claimed that to exist was to be perceived. He was asked, if a tree fell in a forest and no one was around to hear it, would it make a sound. Right now, I am wondering if the arcade version even existed, because so much visual evidence of old arcade games is in Google's search results. Of course, I earlier lamented the lack of information on Sega's Bomber (1977). But at least there's a photo of of the cabin, even if there's no gameplay footage. On with the game, then. 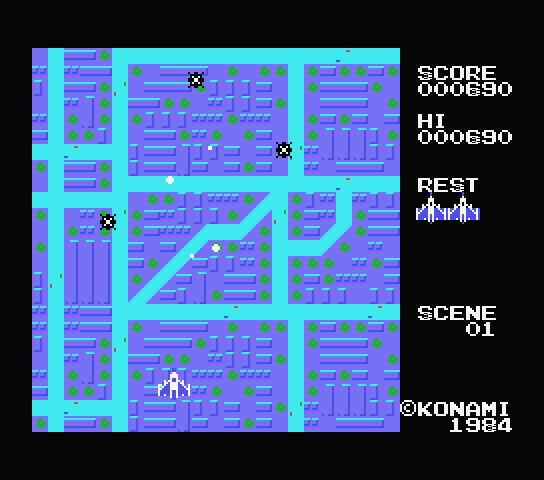 While Sky Jaguar has vertical scrolling background, it's pruned down from Xevious (Namco, 1982): outside of the two bosses, there are no ground targets to attack or attack back. The ground targets are also hit with the same weapon as the airborne ones. The second, tougher boss in the game at the end of the last scene. The boss stays put and the player has to shoot the "eyes". However, Sky Jaguar has powerups, even if very limited ones. Pick up a Pow-icon and the ship shoots two bullets at a time instead of just one. The actual effect this has is minor, as it only adds to the width of the shot, making it easier to hit a target. Pick up another, and the ship can have three shots on screen at a time instead of just two, which makes a big difference. And if the ship is destroyed, all powerups are lost. The game is set in a neverending loop with several scenes (or levels, if you please). Each scene has a number of enemy attack waves: one or two different types of enemies at a time will attack the player. 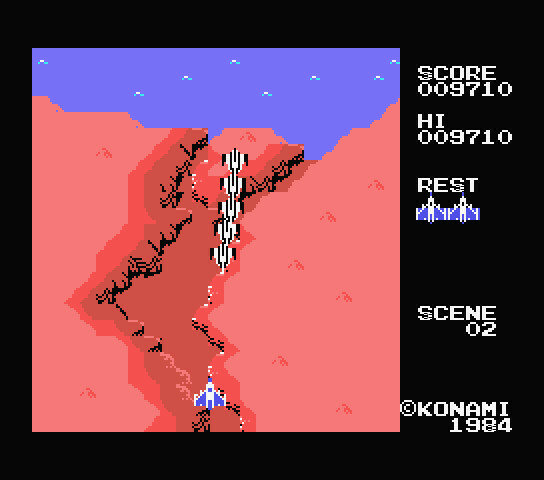 The start of each wave is also a checkpoint from which the player continues after losing a ship. It shouldn't be something to point out, but there are many different enemies, and some of those are unique to certain scenes. At least four enemy types are present in all scenes, but then there are at least five that are specific to a single scene: indestructible enemies, enemies that turn invisible for a while, missiles that split in two and so on. Scene 2; the enemies unique to this scene are the triangles at the top; they bounce a bullet between themselves so fast that the player cannot pass between them. The scenes also flow seamlessly one after another in the sense that the player keeps control of the ship all the time; most scene transitions are just flying over a sea with an enemy wave or two. Once all eight scenes are finished, the game keeps on going with scene 9, which is the same as scene 1 but harder. One thing that piqued my interest is that even the twin shots are narrower than the player's ship. This means that the enemies that dive down when the player is under them are more likely to hit the player's ship if the shot goes off too early, or as in my case, the player is greedy enough to try destroying the enemy despite it being impossible. The smaller white dots are the player's bullets. Of course, this isn't so much the case today: it doesn't take a danmaku to have the ship's hitbox fit behind the bullets' hitboxes. Of the very opposite fashion, Space Invaders (Taito, 1978) and Galaxian (Namco, 1979) gave players big ships and very narrow bullets. This shift could be an interesting topic to pursue later. There's very little music in the game: one tune for game start, second for game over, third when the player is fighting against a boss and another when the player has defeated the boss. That's all. For most of the game, there is no music, just the sound effects that are... basic. The presence of enemy types defines most of the sounds. In fact, the notes some fighters flying down the screen make remind me of Galaga. As for the graphics, the implementation can definitely be seen as lacking. First, the player's ship looks like a plastic toy. There's also zero animation frames until its destruction, and that uses the same explosion animation as the enemies do. Second -- every present-day review I've seen of the game, or at least Classic Game Room's review (I doubt I've ever seen this game reviewed in the 1980s), raises the point of the choppy scrolling that, again, is done in 8-pixel increments. It's not much of a consolation, but the background missing important objects (except for the two bosses) helps. 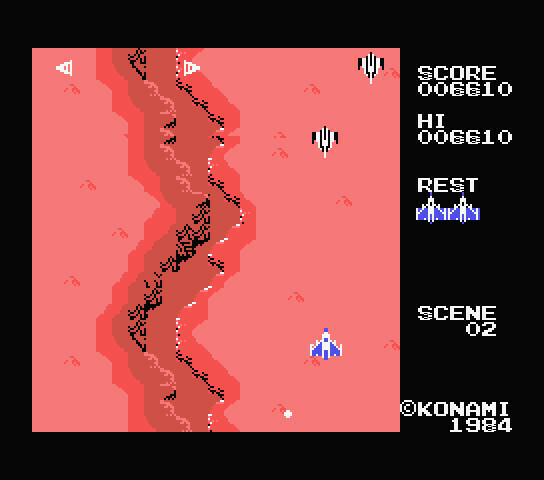 Third -- one scene in the game has very poorly chosen colours: yellow sand with white enemies and white bullets. As a result, it's hard to see either of them well. These are the flapping enemies I'll refer a bit later. The bullets don't really stand apart from the background. The game viewport is also rather limited in size. Whether the reason is speed optimization, an attempt to reproduce the arcade or a game design factor (vertical-scrolling shmups ought to have viewscreens taller than they're wide, I think), I don't know. But in contrast, the sprites are unusually colourful for MSX1 games. Most enemies use two sprites to have two colours, the exceptions being those that are made of two separate parts and one indestructible enemy type. The backgrounds are also quite detailed, even if the scenes repeat their chosen theme from start to end. With understanding of the technical limitations comes the ability to appreciate the cleverness the developers had. The MSX limitation of displaying at most four monochrome sprites on a scanline is a very typical reason for inventions. Remember how I mentioned above how the enemies are made of two colours, with the exception of those made of two separate parts (and one other)? With this limitation, each scanline can show two enemies or one enemy and the player's ship perfectly... if there are no bullets on it as well. But the enemies that are made of multiple parts? The flapping enemies are made of two sprites (left and right wing), and when they are destroyed, the used animation is also a bit different: it is monochrome, unlike most other such cases. This way, the number of sprites on those scanlines isn't increased. The other example is the pair of missiles that separate at certain height and then separately aim towards the player. Until they separate, they can be destroyed with one shot: in this case, the explosion will be the typical two-colour animation. But if a half of the missile is destroyed after the separation, the explosion is just a monochrome sprite. The connecting thread is that the explosions do not increase the number of sprites on a scanline nor does one enemy take more than two sprites at any given time. While this could be due to technical limitation (I didn't care to try going through the disassembly), it fits very well with acknowledging the limits of the system's video display processor. It goes without saying, of course, that most enemies that fly constantly downwards enter the screen just so that their sprites won't share scanlines with other enemies. 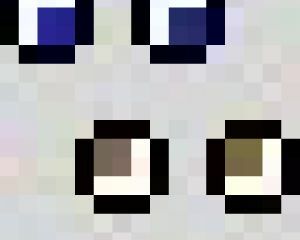 The second regular limitation to worry about is how a row of eight pixels can have only two colours in the "hi-res" graphics mode without using sprites. But how did the game manage the rest of the lives shown on the right? The ships cannot be sprites, because otherwise they'd flicker constantly. But let's take a closer look at the player's sprite and the ship shown on the right. There are two things to note: One, the player's ship is 16 pixels wide, that is, exactly two 8-pixel characters wide. To separate two adjacent ship icons, that ship lost one column of pixels in the middle. The other point of note is how the game really hopes the display is poor and the pixels with mismatched colours aren't too egregious. That's about 6.7% of all pixels "not painted correctly", yet I truly paid attention to it only now. The game is also only 16 kilobytes, half of what Super Mario Bros was, but I understand NES had no real BIOS routines built-in like MSX did. One interesting thing is how the scene backdrops are implemented. The backdrop transitions are obviously unique, but other than those, the main part of each scene actually just loops the same elements over and over again. While this helps to keep the game within size constraints, it also means the levels have no real set pieces. Transition between two areas and a line of enemies that, if all are destroyed, gives 1000 bonus points. I still like the game. 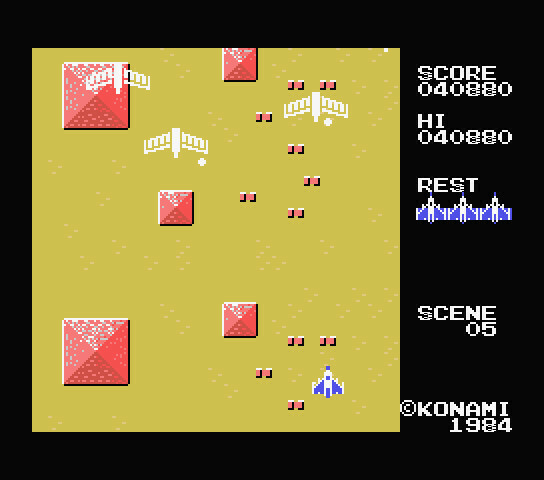 The background graphics are colourful and few enemies are made of single-colour sprites. The enemy wave patterns are different enough to keep one loop of the game from repeating itself too quickly. The jerky scrolling is likely again a major problem for anyone who didn't grow up with MSX games. For whatever reason, Sky Jaguar got a rerelease on Wii U Virtual Console... in Japan only. Have I already said how much I hope the Switch VC to let me get MSX games in Europe as well, even if it means getting them by a Japanese account?